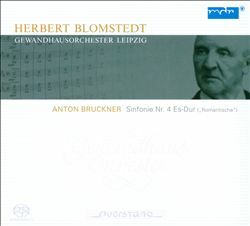 Herbert Blomstedt is a seriously under-rated Brucknerian. There's nothing extreme about his approach, no excesses of dynamic or rubato, yet he is still able to produce readings that are dramatic and compelling, and with a sense of coherency that few of his younger colleagues could match. This Fourth Symphony is an impressive achievement. Not everything in it works, and some of the set pieces are curiously understated, but there are many moments of real inspiration. And any lingering doubts about the more pedestrian sections are ultimately swept away by the majestic grandeur of the outer movement climaxes. The Gewandhaus Orchestra should take as much credit as Blomstedt himself for the success of the recording. Their distinctively warm sound makes every bar a delight. The opulence of the string tone is as evident in the pianos as it is at the climaxes, the brass are a force to be reckoned with, and the woodwind principals put passion and individuality into every solo. The excellent SACD sound also helps the players to shine. It represents the front of the orchestra better than the back for some reason, and the Gewandhaus' excellent timpanist loses out in the mix, but the balance problems are slight. Don't be put off by the matter-of-fact opening. Blomstedt isn't interested in creating a magical atmosphere with this horn solo. Instead, he is already looking ahead to the first great climaxes of the exposition, and when they arrive they more than compensate. The build-ups are always patient and the crescendos evenly graduated. He has an intuitive feel for the exact moment to let the brass off the leash, that point of no return about two bars before each of these climaxes. The inner movements are considerably more relaxed. In the second, the delicate pizzicato of the strings provides the ideal contrast to the flowing and often emphatic melodies in the woodwind. Tempos feel slow throughout this movement, and when the momentum drops the flow of the music is occasionally threatened. No such problems in the scherzo though, tempos are again slow here, but the easy-going feel gives the music an attractive rustic character. Like the opening movement, the finale lacks atmosphere in the distant horn calls of its opening, but again the disappointment is short-lived. Blomstedt manages to create an impressive sense of symphonic breadth by driving the tuttis hard, pulling back in the quieter passages, and always maintaining organic relationships between the fast and slow tempos. The coda is a real treat, and perhaps the most convincing reading of this tricky passage I've heard. The tempo is slow from the start of the long crescendo and remains so right until the end. The gravitas this affords the music is exactly what it needs to end the work effectively. An impressive offering then from Blomstedt and the orchestra he led for so many years. In the spectrum of Bruckner interpretations that stretches from Karajan the opulent Romantic to Günther Wand the Schubertian Classicist, Blomstedt is somewhere in the middle but with a distinct emphasis towards the Karajan. His detractors might call this middle-of-the-road Bruckner, but I'd be more inclined to describe it as the best of both worlds. This review appears in issue 36:3 of Fanfare Magazine.